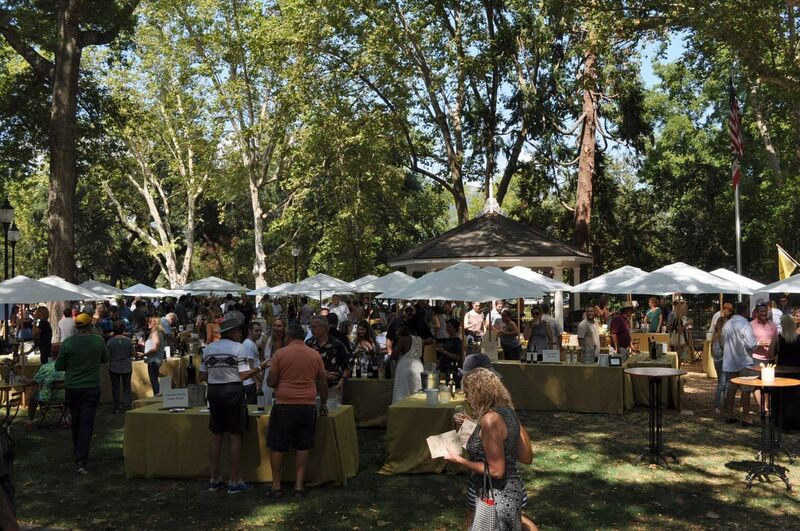 Your West Coast Oenophile is hitting the road this month for several events not previously chronicled here. Even with my database for Sostevinobile now exceeding 4,400 wine labels, there are new ventures to discover and explore, new alliances to be formed—almost on a daily basis. With my new partnership in producing wine tastings, the hope is that many undiscovered labels and West Coast wine regions will be coming to me, but until I can build enough momentum, I continue to go out in the field and meet the wineries on their turf. Not that it’s bad to escape the pressures of urban living, traipse around the vineyards and garner a healthy layer of mud on my well-worn Lucchese boots.Or wander about a verdant lawn where 20 or so vineyards are showcasing their latest releases. And so it was my anticipation as I headed out to the northernmost AVA in Napa for this year’s Calistoga Wine Experience. Calistoga vineyards may predate statehood, but the AVA here was not officially designated until 2010; as such, I have not had many opportunities to taste a wide selection of these wines collectively and not on their own turf since their inaugural event at Première Napa a few years back. And so it came as quite a surprise that this gathering on the turf at Pioneer Park, a tiny, pristine suburban oasis alongside the Napa River, just off of downtown’s Lincoln Avenue was covered in its entirety with Astroturf! Or—pardon my Franglais—to put it more succinctly, a Partée de Faux Grass! Still, the wines were quite genuine and delectable, accentuated by an abundance of shrimp and other catered hors d’œuvres. Not surprisingly, these crevettes were perfectly complemented by the 2014 Sauvignon Blanc from Jones Family Vineyards, a multi-generational Calistoga institution. I also cottoned to the immense 2015 Huge Bear Chardonnay Sonoma County from Huge Bear, and a delightful 2016 Chardonnay from Vincent Arroyo. Given Calistoga’s proximity to Knight’s Valley, it is not uncommon to find grapes, particularly white varietals, sourced from just over the border, but no other region can rival Calistoga for its signature varietal, Charbono.While there may be arguments about this grape’s pedigree or even its DNA, there can be no denying that it makes for a most appealing wine, particularly from its heirloom clone.I have long championed Tofanelli for its mastery of this grape, and the 2015 Charbono poured here perpetuated this admiration. The surprise here, though, was discovering their 2013 Estate Grenache, an equally compelling wine. From the eastern side of Calistoga, the revitalized August Briggs showcased their exemplary 2015 Calistoga Napa Valley Charbono, a spritely expression of this exuberant grape. I would have expected Shypoke also to be pouring their Charbono; instead, featured an exceptional 2015 Olivia’s Sangiovese.Calistoga.Plus, their 2015 Keep married a select blend ofCharbono, Grenache and Petite Sirah. Because it falls outside the central thoroughfare of Napa Valley, Calistoga is more apt to veer from the Bordeaux orthodoxy of the Yountville-Oakville-Rutherford-St. Helena continuum, as other outlier AVAs like Coombsville also practice. A wondrous expression of innovative mélange came from the venerable Storybook Mountain, whose 2014 Antaeus blended Zinfandel with Cabernet Sauvignon, Petit Verdot, and Merlot. 2880 Wines countered with a Rhône-style blend of Grenache, Petite Sirah, and Petit Verdot, their 2014 Twenty-Eight Eighty Red Wine. Of course, true Bordelaise expressions also abound in Calistoga, starting with the splendid 20015 Cabernet Sauvignon from Jack Brooks, the microproducer that had extended me the invite for this afternoon. Renowned for its Chardonnay, Château Montelena nonetheless furnished an exquisite 2014 Estate Cabernet Sauvignon, a delicate blend with only 2% Cabernet Franc and 1% Petit Verdot added. New ownership has brought considerable changes to Clos Pégase, but their superbly matured 2003 Cabernet Sauvignon poured here harkens back to their Jan Shrem era. Other notable Cabs came from Poggi, with their 2014 Twin Palms Vineyard Cabernet Sauvignon (like the Montelena, slightly rounded out with Cabernet Franc, Petit Verdot, and Merlot) and from Olabisi, their 2014 Napa Valley Cabernet Sauvignon, selected form designate vineyards in Calistoga, Rutherford, and Atlas Peak. I have long thought of Jax as one of San Francisco’s urban wineries, but with their vineyards in Calistoga, they constitute a vibrant part of this AVA, as evidenced by their delightful 2016 Estate Cabernet Sauvignon, an approachable young wine tempered with 3% Cabernet Franc. On this warm evening, I found myself particularly impressed with the panoply of wines Switchback Ridge poured here. The bold, expressive 2014 Merlot Peterson Family Vineyard soared alongside the 2014 Cabernet Sauvignon Peterson Family Vineyard. Winemaker Bob Foley has long been justly revered for his Cabernets, but here showed himself equally adept the 2013 Petite Sirah from the same estate site. Nonetheless, his hallmark had to have been the utterly opulent 2014 Cabernet Sauvignon, a near-flawless library offering. I finished off the event with Calistoga Winegrowers’ former President Tom Eddy, an unheralded vintner greatly revered by wine connoisseurs. Usually I am dealing with palate fatigue at this point in a tasting of this scope, but for once they saved the best for last, the 2013 Napa Valley Cabernet, a multivineyard blend accentuated with 17% Malbec, the unheralded star of Bordeaux’ Big Five red varietals. Look for both wine and winemaker to come into promince in 2019. This entry was posted in Cabernet Franc, Cabernet Sauvignon, Charbono, Chardonnay, Grenache, Malbec, Merlot, Petit Verdot, Petite Sirah, Sangiovese, Sauvignon Blanc, Uncategorized and tagged 2880 Wines, August Briggs, Canard, Château Montelena, Clos Pégase, Huge Bear, JacK Brooks, Jax, Jones Family, Kenefick Ranch, Olabisi, Poggi, Romeo, Shypoke, Storybook Mountain, Switchback Ridge, Tofanelli, Tom Eddy, Vincent Arroyo on September 28, 2018 by donaldmarc.